The first experiences in this charming little Kingdom of Wonder are a full assault on the senses, despite regular travel outside comfort zones. 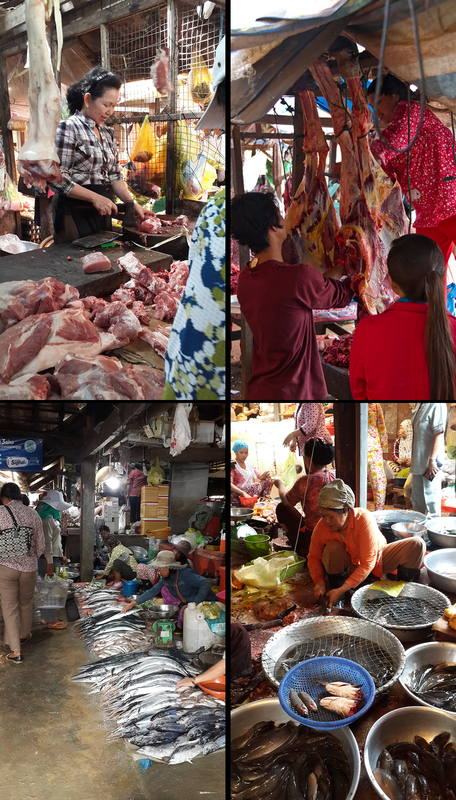 Our photo archive is bursting with what was once so unique and interesting — market scenes, street sights, exotic fruits. But after many years of working and living here, these scenes reduce to mundane. Thanks to the gang at the Multicultural Kid Blogs, however, I can filter through our images with fresh eyes. In this series, bloggers around the world give a tour of their neighborhood and town. What does a local playground look like in Astana, Kazakhstan, or how about a school in Izhevsk, Russia? It’s great for kids to see such differences in our daily lives around the world and yet, how much of it is so similar. 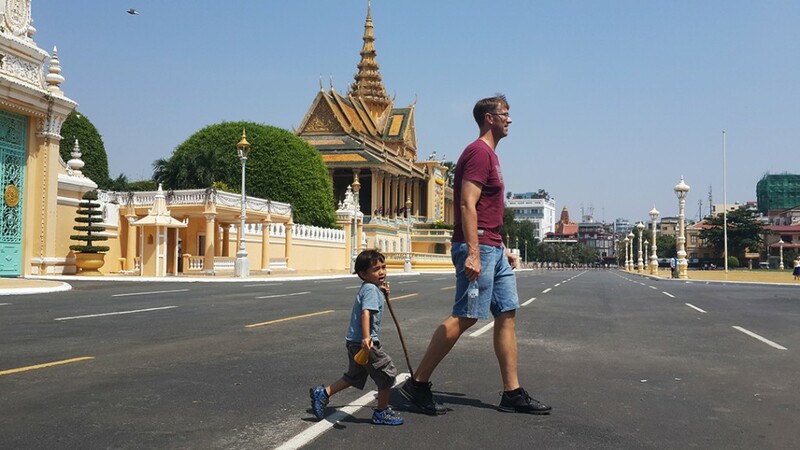 Notwithstanding the cultural ramifications of a tragic history, Cambodia is a fascinating destination — for its friendly people and curious embrace of Westerners. 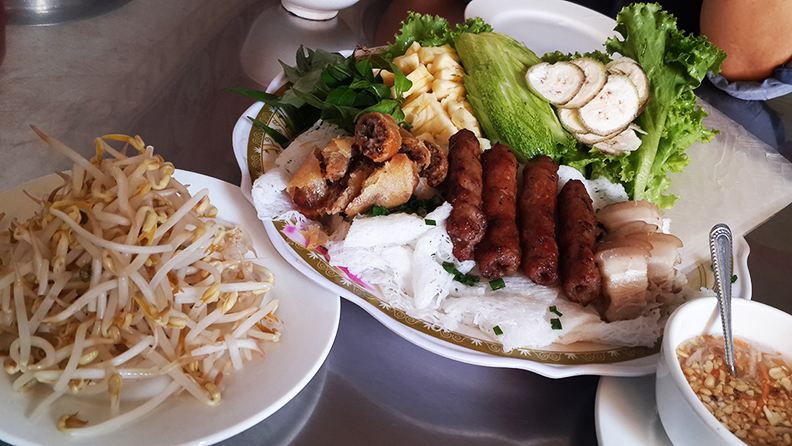 Here below are our stomping grounds around this adopted city of Phnom Penh. Local school Our kids play here regularly as it’s nearby. 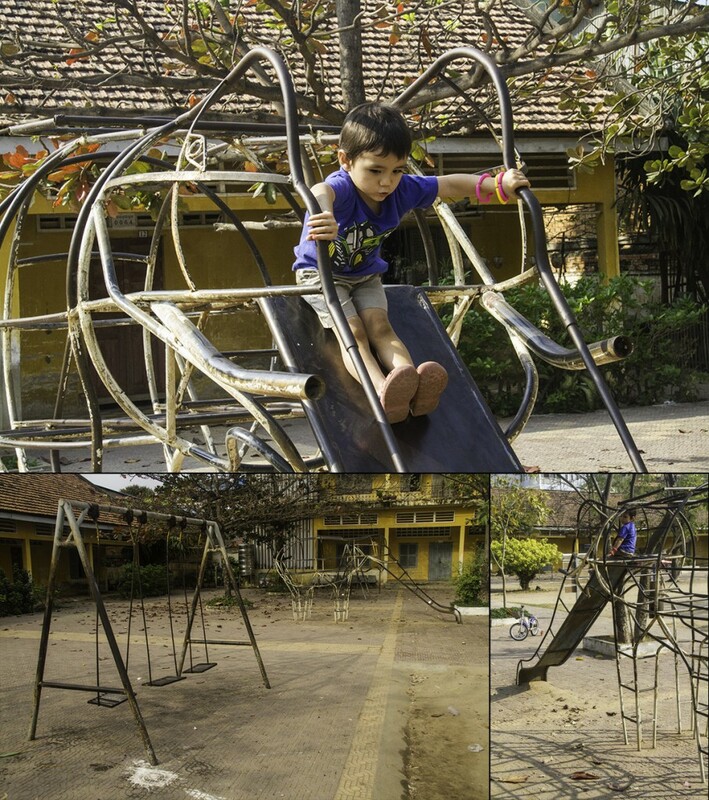 It’s usually packed with Khmer and Vietnamese families and kids. Our favorite thing about it besides the people there is the elephant slide. 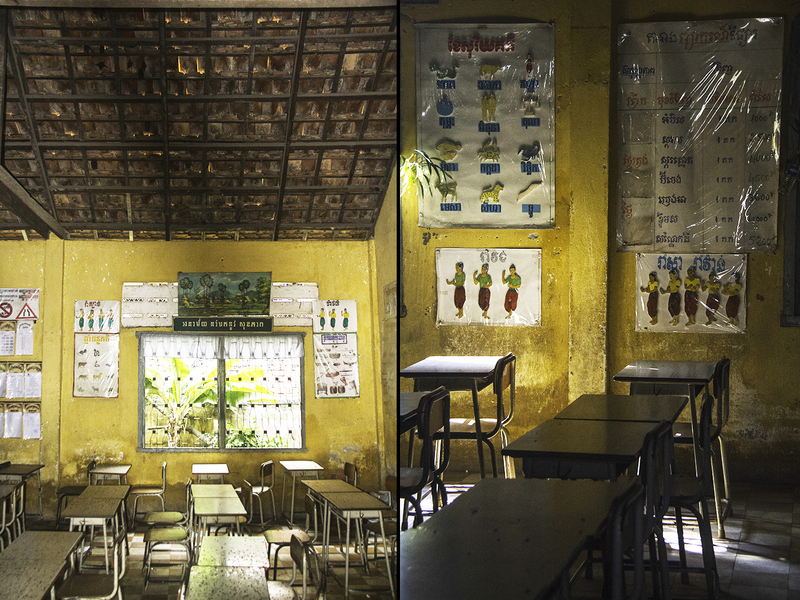 Public schools across the country are built in a similar style — long buildings up to three storeys tall with large rooms that accommodate around 30 children. The grounds have two or three of these buildings, painted the same color yellow, with an open courtyard in the middle. 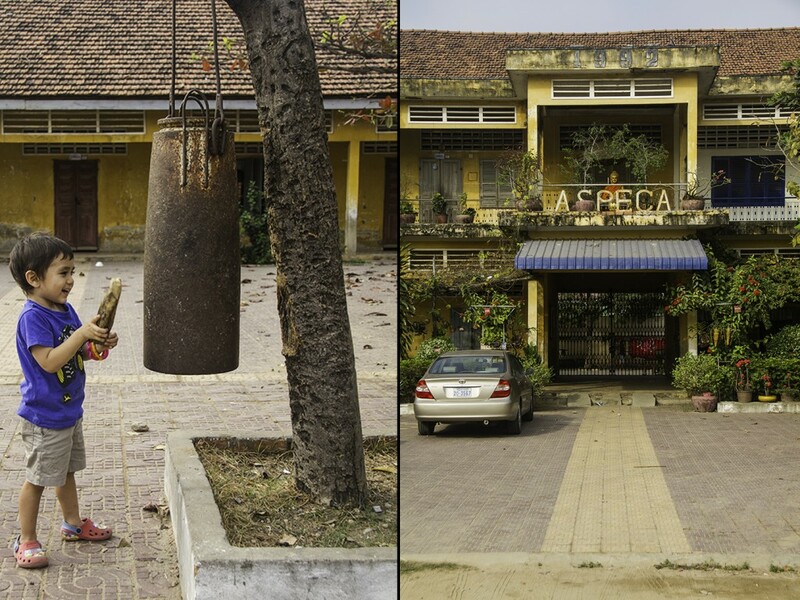 Their school bell is an old ammunition shell. This particular facility is supported by Enfants d’Asie, which shelters orphans and children either on the grounds or on a daycare basis. Its ceilings are home to roosting bats, but despite that, the rooms are tidy and clean. This and other public schools tend to be open so the community can use the grounds for exercise and recreation when classes aren’t in session. 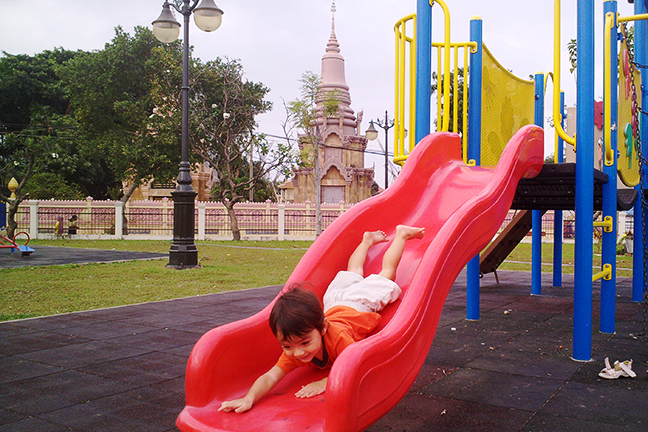 Public playground Over the past 10 years, a municipal beautification project has turned the wide boulevards and grounds in the country’s provincial capitals into colorful play spaces, complete with exercise stations and/or playground structures. Local Transport It’s the start of the rainy season here, and rumok-motos (below) are a sturdy mode of transport on the muddy secondary and tertiary roads. It takes passengers for ~500Riel (US$0.125) along its routes to and from the markets. Tuk tuks are common in the cities. There’s little elevation in the area surrounding Phnom Penh, so it’s relatively easy for motorbikes to haul passengers around in these. They get converted to mobile vendors (pizza, coffee, etc) for locally unique attractions. Motorbikes are also popular. People can pick up moto-taxis on street corners or by flagging one down on the street. It’s a cheap set of wheels for a family starting out, and only recently is the government beginning to crack down on overloading them with passengers or cargo. (I think the most people I’ve seen on one was 8 — 5 adults and 3 small children!). Markets They’re everywhere, and they have it all — produce, eggs, meats, seafood. Keep those eyes peeled for easy to spot animals from endangered species, mixed into the piles on offer. Take a break for an iced coffee or small snack. This woman makes the tastiest iced coffee! 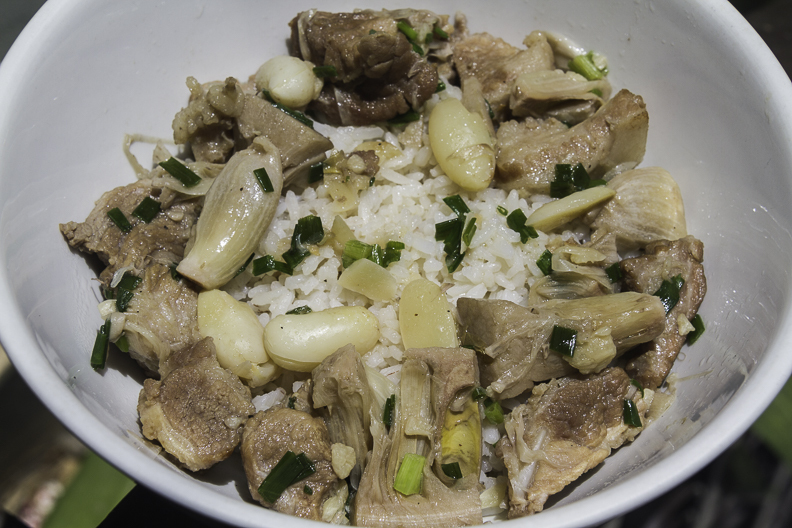 — and for 2000riel (US$0.50)! At the end of the day, have it with a shot of Bailey’s. Ohhh heaven. 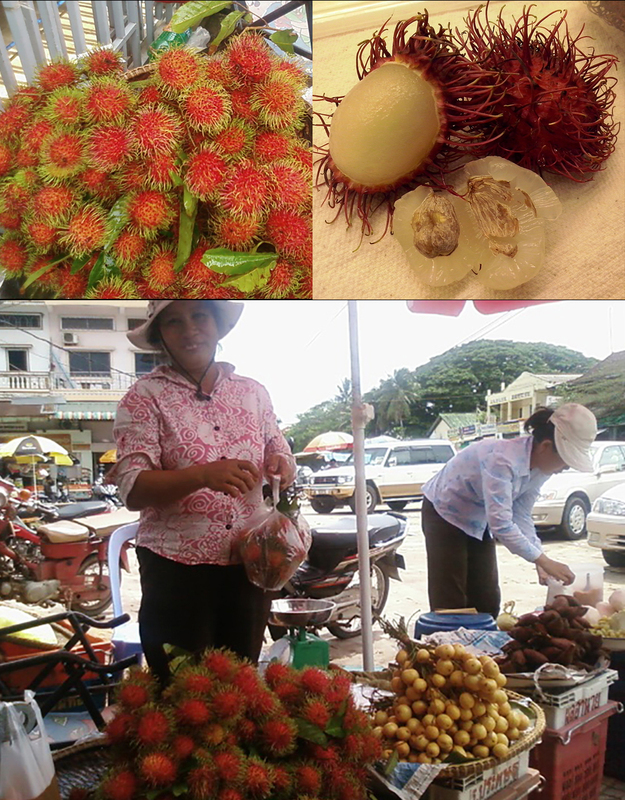 Check out those brilliant rambutans she’s selling; they are in season now. 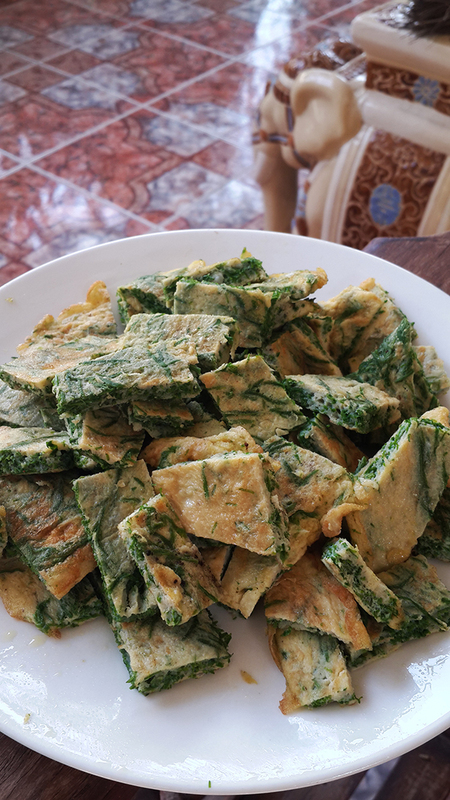 My son can eat several kilograms of this fruit in one sitting, which is great because it’s an antioxidant powerhouse that rivals pomegranates and acai. Here they are opened up. 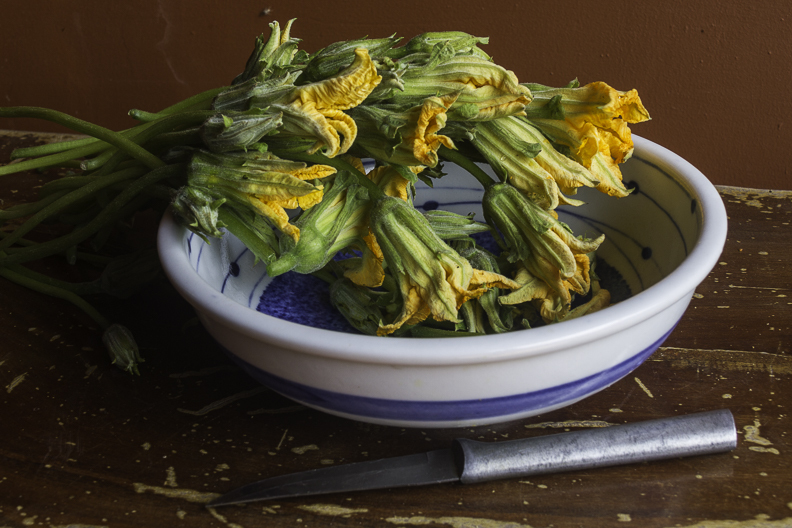 It is juicy when ripe, can be both mildly sweet and sour, with a bit of acidic aftertaste. 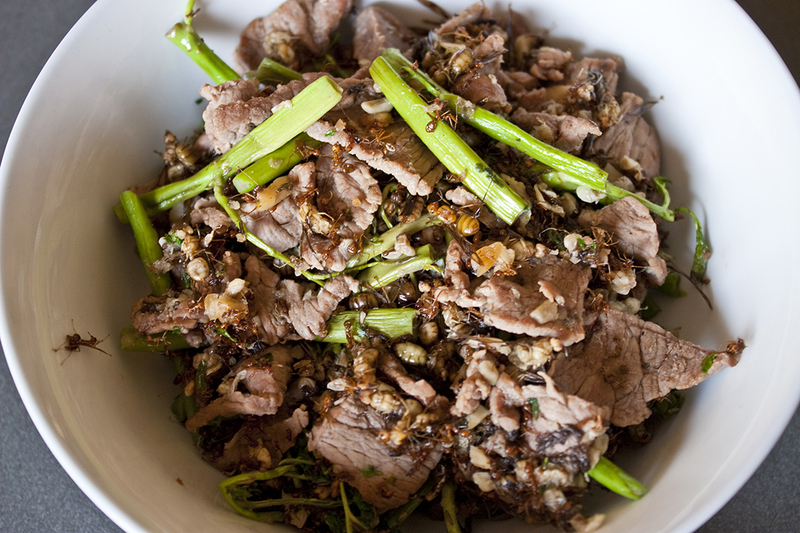 A small piece of bark always gets stuck to the meat, but it doesn’t affect the taste. Elsewhere around the city, produce vendors cluster in shaded areas. Haggling is a sport, but it’s only the start of your purchase; selecting the sweetest out of a pile of fruit that look similarly tasty is not a simple task. Fruit that are weighing their trees or bushes down are picked all at once and stored in dark cool corners of the house, wrapped in newspaper. They’re put on the table out front for sale as they ripen. Street scenes We frequent the riverside, where our Khmer/Vietnamese friends own an English Pub. It is a tourist hub, and a draw for many young Khmers, for the bustle of activity. Need some Happy Pizza (weed topping)? Want to exercise? Have a drink? 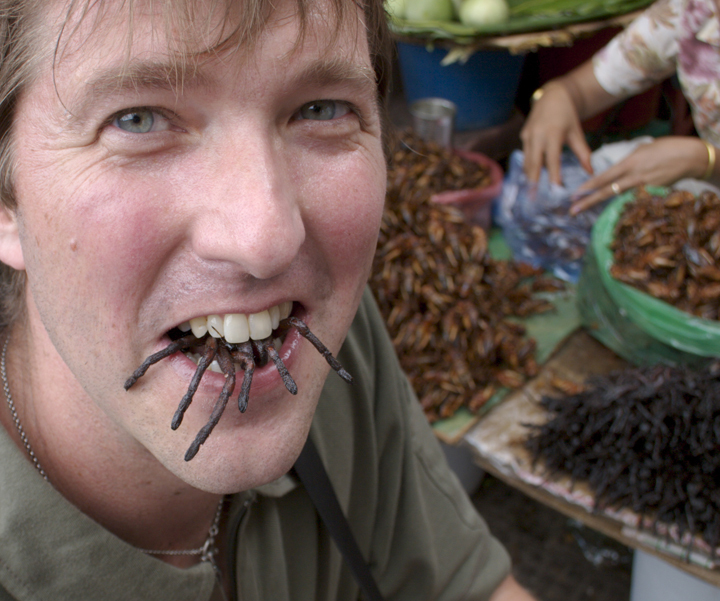 Chow on some local delicacies such as fried insects (tarantula is a favorite) or fertilized duck egg? This is the place to be. 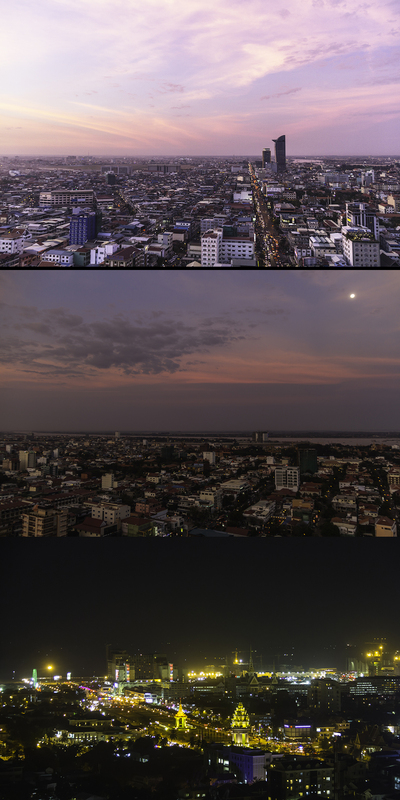 Head over to Phnom Penh at night for some night time scenes. Other iconic sights include coconut sellers and meal vendors. Weddings Reception halls are a recent concept, and because the Chinese shop houses are not laid out for parties, these makeshift tents spill out to the street for weddings. Seeing these get assembled brings on a good groan from foreigners; the regular and frequent pop up nature of these congestion points can be aggravating (not to mention the music turned up past the capacity of the 16 speakers these tents come with!). 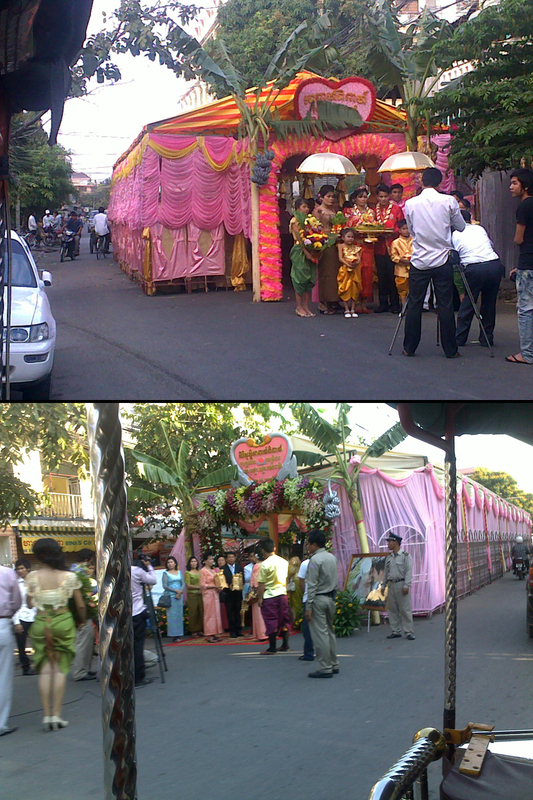 Apart from that, the rituals of the traditional three day Khmer wedding is a study in this region’s culture and legends. Rapid modernization Safety is a luxury for workers in an economy that’s eagerly modernizing. Check out this guy outside the fifth (fourth) floor window without contraptions to prevent injury from above or to avert falls. This is the case for local builders. Phnom Penh now has several high-rises, the tallest of which is Vattanac Tower at 39 storeys — it is the one that looks like an Angry Bird in the skyline. 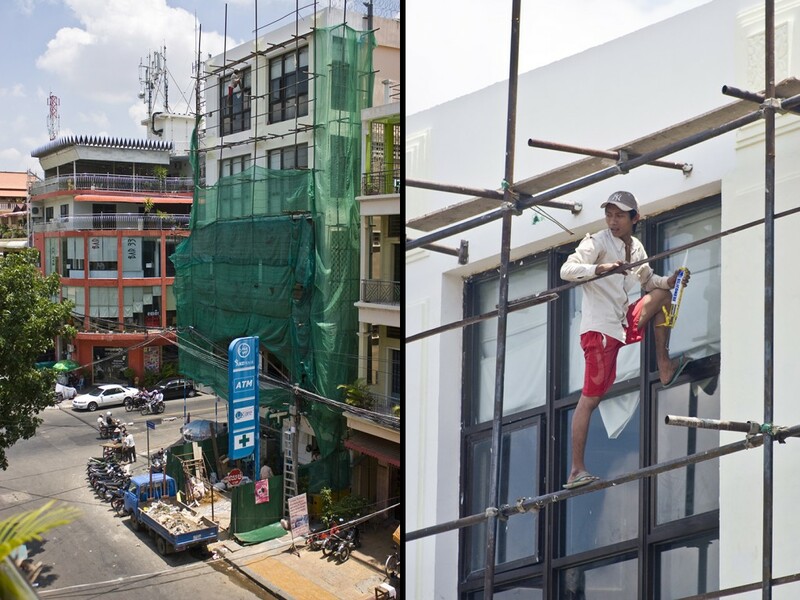 They (thankfully) commission development firms abroad for these, and for the most part they do observe international safety standards. Below are skyline views of the city. It is a small city, comparatively, but sprawling. I can’t quite capture the sheer number of construction around the city. Developers are eyeing the prime real estate of the riversides (this city sits on the confluence of two major rivers, the Mekong and the Tonle Sap). Check out at all the other great destinations we have been and will be discovering, on thepiripirilexicon.com! take as many night buses as you can. try to get up for the sunrise at ankogr wat. 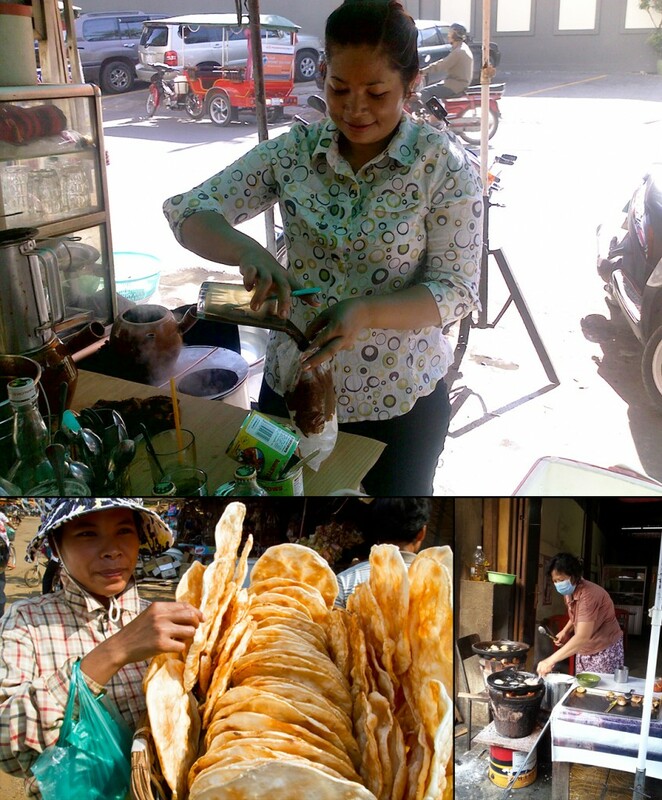 in seim reap eat at the khmer kitchen, le papier tigre, the blue pumpkin (good for snacks). Hi – thanks! We miss it and will definitely be back. Such a charming place with very sweet people. Do go for a visit and post your experience! Southeast Asia is fantastic and I would go back to live in Asia anytime..